Main Street Mat is proud to be a member of Partners For A Clean Environment. PACE partners are leaders in the business community who are setting the standard by meeting industry-specific criteria, including energy and water efficiency, resource and hazardous waste management, green purchasing, sustainable transportation, water protection, and the use of less-toxic chemicals. Soil is everywhere and managing it is a vital part of our everyday existence. At the heart of every effective rental mat program is the prevention of contaminants from entering a building. The U.S. Green Building Council has developed a rating system for new and existing buildings to encourage building owners to earn credit for meeting certain housekeeping criteria. HOW SHOULD AN EFFECTIVE RENTAL MAT PERFORM? Stop soil and water. Up to 85% of all soil enters a building on the feet of the building occupants. High performance mats are more effective at stopping soil from entering buildings. Store soil and water for removal at a convenient time. Storingmeans that a high performance mat retains soil in a place whereit can be removed effectively and safely with minimum impact on the building. An effective rental mat stores the soil and water until it is removed during the professional laundering process at the Textile Rental Company. A building with minimized contaminants reduces the amount of cleaning chemicals required. This reduces airborne contaminants and volatile organic contaminants from cleaning chemicals, thereby improving a building’s Indoor Air Quality. Minimize tracking of stored soil and water into the building. Amat with high twist, heat set nylon yarn not only effectively removes dirt from the soles of shoes, but it also filters dirt and water down to the base of the carpet to prevent it from being transferred into the building. This is perhaps the most important thing an entrance mat should do. Mats with a non-heat set carpet surface will crush flat and once soil is deposited on these mats, it can reattach to the shoe of another person and be tracked further into the building. Provide a safe surface for traffic. Effective rental mats utilize aslip resistant nitrile rubber backing, which provides traction for themat on the floor. 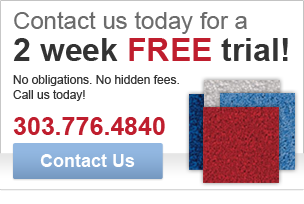 These mats are designed to reduce the incidences of slip/fall accidents on unprotected floor services. The High Twist, Heat Set Nylon Yarn brushes soil and dirt from the soles of shoes. This allows the dirt to filter to the base of the carpet to prevent track off. Safety is provided by the slip resistant nitrile rubber backing, thereby protecting against slip/fall accidents. With a variety of product types and an extensive array of sizes and colors, Main Street Mat Company’s mats are an integral part of a Green Building’s entrance. Over three-quarters of the dust, soil, and contaminants in a building come through the door on people’s feet, damaging carpets, floors, and adding to the cost of maintenance. It’s been estimated that one square yard of carpet accumulates a pound or more of dirt in a week. Up to 85% of the soil brought into any building can be contained within the first 10 to 12 feet. The Green Building Program is dedicated to providing a healthy work environment by encouraging the use of industrial products that are disposal friendly, thus reducing the need for landfills. In the Textile Mat Rental Industry, a mat’s performance life is extremely important. An entrance mat manufactured with high twist, heat set nylon yarn is extremely durable. With professional laundering, the life of the mat can be extended, prolonging its performance. There is a growing concern within the green community over the use of vinyl in building materials. Concerns over emissions vinyl can release during production or disposal can discourage buyers from purchasing products containing them. 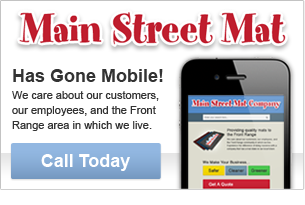 Main Street Mat’s high performance entrance mats are manufactured 100% PVC free. Green Buildings are designed, built, and maintained to protect the health and safety of their occupants, maximizing their comfort and productivity, while minimizing the impact on the outdoor environment. Green cleaning is most simply defined as cleaning to protect health without harming the environment. Green cleaning is a comprehensive approach to maintaining a facility, including chemicals, equipment, paper supplies, entry way mats and procedures that minimize the impact of cleaning on human health and the environment. The Environmental Protection Agency estimates that indoor air may be 2 to 5 times as polluted as the air outside. Other research shows that up to 85% of the dust, dirt, and contaminants that enter a building are tracked in from the outside on people’s feet. Green buildings are simply good business. Scientific studies have documented productivity increases of 0.5% – 7% associated with greener indoor office environments. We are PACE (Partners For A Clean Environment) certified.